BEIJING (AP) — An outspoken critic of China’s internment camps who now lives in Istanbul says his wife and son face potential deportation to China because Turkish authorities might bar them from entering the country. Omir Bekali, a Kazakh national, told The Associated Press on Tuesday that Turkish authorities are holding his wife and 2-year-old son at the airport in Istanbul and are accusing them of using fake passports. Bekali was among the first to speak publicly about the ordeal he endured in new indoctrination camps in China’s far western region of Xinjiang — camps that China denies exist. Bekali told The AP in a report in May that he and dozens of other Muslim minority Kazakh as well as Uighur detainees were held in camps for months and forced to disavow their Islamic beliefs, criticize themselves and their loved ones and give thanks to the ruling Communist Party. The camps are estimated to hold upward of 1 million people and reports about them have drawn growing criticism of China from the U.N. and the U.S. The U.S. is considering sanctioning Chinese officials responsible for the stifling security crackdown in the region. Bekali returned to Kazakhstan after being released from detention but moved to Turkey earlier this year, fearing for his safety. 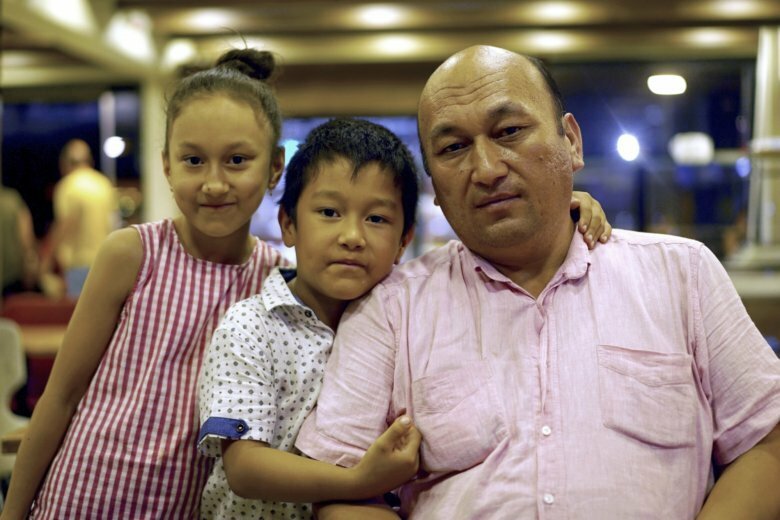 His wife, Ruxianguli Taximaimaiti, 45, a Chinese ethnic minority Uighur, and their youngest son Mukhamad Bekali were to join him in Istanbul this week. They arrived in Istanbul on a plane from Almaty on Sunday night. Bekali, who had been waiting for them at the airport, got a call from his wife telling him that border police weren’t letting them into the country. Turkish airport authorities accused his wife and son of holding fake passports, Bekali said, and had earlier booked them on a flight back to Kazakhstan, where she no longer has a valid visa that would allow her to stay. “I’d rather die here in Turkey then go back,” she had told Bekali at the time. It was not immediately clear if they boarded any flights. Attempts to reach Turkish airport police for comment on Monday were unsuccessful. If they are sent back to Kazakhstan, Bekali said, authorities in that country would likely deport his wife back to China where she could be punished for his criticism of the indoctrination camps, leaving nobody to take care of his son. Xinjiang, the tense region where most Uighurs live, has been enveloped in recent years in a vast dragnet of police surveillance which authorities insist is needed to root out separatism and Islamic extremism. Critics of China’s policies in the region and the harsh restrictions imposed on Uighurs and Kazakhs have been punished severely. Zhang Haitao, a Han Chinese electronics salesman who complained online about the treatment of Uighurs, was sentenced to 19 years in prison in 2016. Prominent Uighur scholar Ilham Tohti, a moderate critic of the government’s policies in the region, was handed a life sentence in 2014 on charges of fanning ethnic hatred. Bekali said the uncertainty over his wife and son’s fate had reignited a persistent anxiety he had about China and the detention he had left behind.